Charles Brown resides in Duluth, Georgia, just north of Atlanta. He is a graduate of the Georgia Institute of Technology, where he received a B.S. degree in Building Construction from the College of Architecture. He practiced architecture for a short time before entering the commercial real estate field in Atlanta. Since that time, Charles has been involved in various phases of the Real Estate profession, including brokerage, consulting, developing and marketing, not only in the Southeast but also nationally and internationally. Mr. Brown, now with Tower Partners Group, an affiliate of Crown Holdings Group, is actively involved with the acquisition, development, planning and management of a significant property in the Central Perimeter market of Metro Atlanta in the City of Dunwoody, 244 Perimeter Center Parkway. The building is approximately 260,000 sf, sitting on 15 acres, and the site is zoned for upwards of 2,000,000 sf. Mr. Brown also presently serves as an independent director of Columbia Property Trust, a NYSX listed REIT where he is a member of the Audit and Operations committees. Mr. Brown’s experience includes management, marketing and development of mixed use, commercial, office, industrial and residential properties. He has served as an officer in the four firms with which he has been previously associated and worked with the owners or partners in the developments noted. Just prior to joining Technology Park/Atlanta, he was the Director of Marketing and Project Manager for one of the South’s largest multi-use complexes, Atlanta Center- a 2,000,000 sf Hilton Hotel, Trust Company Bank (SunTrust) office, shopping project in the central business district of Atlanta. Four of the most notable developments with Mr. Brown’s direct involvement are: 1) Technology Park/Atlanta, a 600 acre, 4,000,000 sf office park in Peachtree Corners just north of Atlanta; 2) John’s Creek in North Fulton County, a 6,000,000 sf mixed use park; 3) Lenox Park, a 2,000,000 sf mixed use park located in Buckhead; and most recently 4) Atlantic Station, a mixed use project in Midtown Atlanta planned for upwards to 15,000,000 sf. With the Atlantic Station project, Mr. Brown was responsible for the concept, rezoning, master plan, transportation and erection of the 17th St. bridge across Interstate 75 and 85 with the FHWA and GADOT and remediation of the brownsfields site via an “XL” project again with federal, state, and local governments, headed by Federal EPA, as well as the coordination of the design development of approximately 2,000,000 sf of the initial office, retail and residential space. Of that space he was directly involved with, and a participant, in the 500,000 sf Wells Fargo office building. Atlantic Station has won many local, regional, and national awards for design, execution and community improvement. Notable among those were: EPA’s “Phoenix Award as the Best Brownfields Redevelopment” in 2004, and The Sierra Club’s “2005 America’s Best New Developments” listing. Obviously, Atlantic Station is an urban project which is continuing to develop and add to the value of the community. Technology Park/Atlanta and John’s Creek are business parks designed and operated for technically oriented industries, and they combine office, lab and light manufacturing in a low-density environment. Lenox Park is a multi-use urban development capturing a park atmosphere, constructed on an old golf course, and connected directly to the Lenox MARTA Station and the urban environment. Technology Park/Atlanta was selected for the Governor’s Award for its contribution to community economic development. John’s Creek was honored by the FIABCI Prix d’ Excellence for Best Office/Industrial Property in the World. Lenox Park won the Design of the Year Award in 1989 from NAIOP. Mr. Brown is married to Brenda Jones Brown, who is an accomplished pianist and organist. They have two sons and daughter-in-laws, Jeff and Candace Brown, and Scott and Karen Brown, who each have three children. All of the Browns are active in outdoor sports such as golf and running. 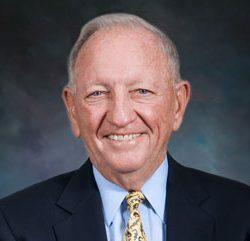 Mr. Brown has been involved in junior golf for several years and was the Chairman of the 1982 Junior World Cup Tournament that was held in Atlanta. He also serves on the board of the GA Tech Golf Committee. Charles and Brenda are members of Dunwoody United Methodist Church, where he is past Chairman of the Administrative Board and Building Committee and Brenda is heavily involved in the music program. Centennial Olympic Park Area, Inc.